Fear is not your friend. It plays the role of antagonist in the story of your life. Fear is a silent killer. It is a lethal injection that cripples and paralyzes you from making decisions. From taking advantage of life-changing opportunities. From living out your God-created identity. The peculiar thing about fear is that it is a matter of perception, not truth. Everyone is not afraid of the same things. What are your fears? The fear of failure? Fear of loss? Fear of hurt? Whatever your fear is, it must be cast out in order to achieve success in life. With The Jesus Mind, you are empowered to overcome even your greatest fears. Jesus is the author and finisher of faith. Satan is the author and finisher of fear. Fear is faith in the devil. The Jesus Mind is having parallel faith in Christ, looking at His example. In our human nature, we cope with fear in something known as the “Flight or Fight Response.” When something freaks us out, the first response is to run. The other response instead of running is ignoring every instinct…and fighting. Standing up to your perceived fears. When the first Adam sinned in the Garden of Eden, fear was an immediate result of his sin. He hid from God. He ran from his responsibilities. Listening to the lie of Satan, he was deceived into believing a false feeling. The last Adam, Jesus didn’t run…he fought. The cross was the scariest place to face. He was taking upon Himself all of our sins and the fears that come along with it. Jesus faced all of humanities greatest fears when He went to the cross! If Jesus faced fear, you will too. Recognize that the little voice of fear challenges us all. We’re not ignoring that it doesn’t exist. But on the shores of life, you can stay on the sand or go swimming with the sharks! 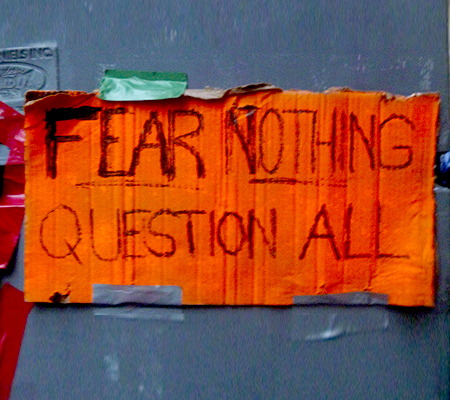 The reality is this…The only way to conquer fear is to live dangerously. To stare it in the face! The Jesus Mind is a fear-free mentality. How do we develop it? Become consumed by goals. See what’s more valuable to you and live for it. Jesus had a “joy set before Him”. His goals birthed within Him a passion and love to cast out all fear. Because fear is perceived, the only way to overcome it is by actually facing it! You can’t hide from it, ask someone to face it for you or even pray it away. You have to challenge it. When you realized there was no monster under the bed, you lost the fear of the dark. Most times, fear is simply displaced with knowledge. What you know about, you’re no longer afraid of. Get around other faith walkers. Faith is contagious…and so is fear. The difference between the successful and unsuccessful, the rich and the poor is how they deal with fear and failure. “Everything that you want is on the other side of fear.”-Jack Canfield Face your fears today! Go where you haven’t gone before. Life begins at the end of your comfort zone. Be bold, the Lord is with you!